Party lashes, another name for Cluster Lashes or flare lashes. The reason they are called Party Lashes is that they are only really intended to last for a special occasion. They will usually only stay on for a few hours to a few days. 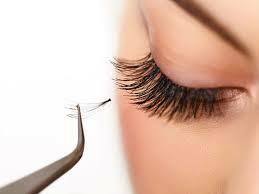 False eyelashes come in a multitude of lengths and styles. Some have feathers on the outer edge and some have diamonds on the tips of the lashes. Cluster lashes are groups of lashes bonded together. You can just place a few at the outside edge of your natural lashes or place a full or half a row of them on your natural lashes. They can last up to two weeks but it is important to manage your clients expectations, as this will naturally depend on several conditions and also that the client follows aftercare advice. You will be issued with a Diploma in Party Lash Techniques and the course is fully insurable to be able to start off your career in this exciting industry! Certificate will be issued on the day if the student successfully passes a practical assessment. You will be issued with a Diploma in party lash techniques and the course is fully insurable to be able to start off your career in this exciting industry!